Sometimes we find that events seem to repeat themselves but it is rare that they keep on doing so. However, that happened to John and Maureen Franklin after they read our article about the Gale Family in Issue 1 which told the story of David and Caroline Gale with brief details of their children and their neighbours, the Franklin family. 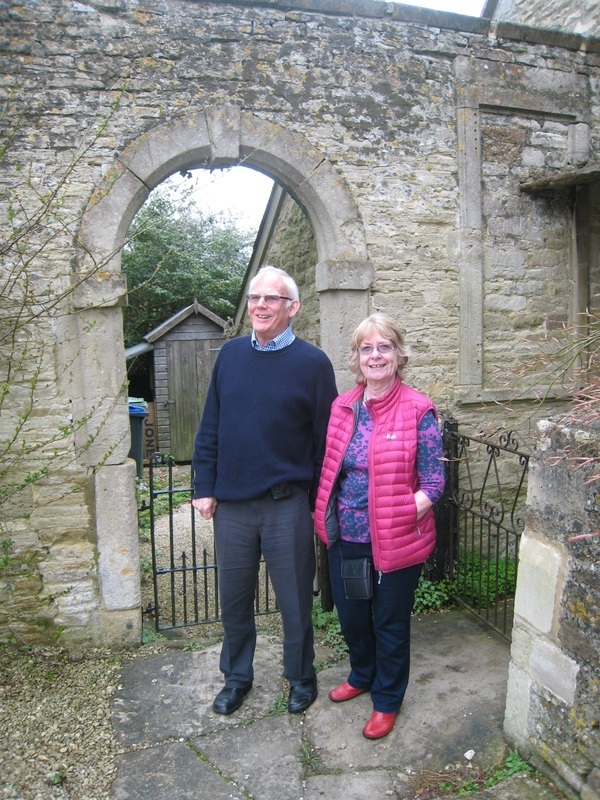 John and Maureen arranged to visit The Old Jockey in Box to see the home of their maternal and paternal ancestors a century earlier. We pick up John's story after a brief recap of the history of the Gale family. The story of this charming couple is related in The Gale Family in the first issue of the website. It tells of their life in Victorian Box, of the changes made when Old Age Pensions were started and of their diamond wedding celebrations in 1936. These newly-found pictures give us a glimpse of this delightful elderly couple. David Gale (1851 - 1939) and Caroline Ellen (1856 - 1938) married in 1876 in Chippenham District.They had two daughters: Beatrice E (b 1876) and Emily Ellen (b 1879). It was the younger daughter, Emily Ellen Gale, who married into the family of her next door neighbours at The Old Jockey, the Franklins. Emily's story is given later in this article. 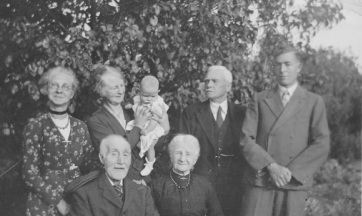 The photograph (left) shows Emily (holding baby) with her husband, David Franklin, and parents, David and Caroline Gale (front). On the right is Emily and David's son, Len (father of the baby). 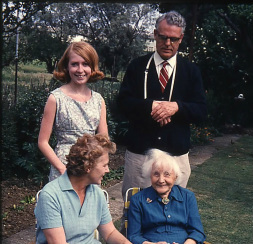 We wonder if the lady on the left is Beatrice, the older daughter of David and Caroline. The Franklin family came from Box and several stayed in the area most of their lives. There were eight children in the family: Harry, Bill, Edward, Lena, Lucy, Francis, Arthur and David Herbert Franklin. Harry George Franklin (1869-1947) remained single and the 1911 census shows him living at Old Jockey with his widowed mother and brother, Frank. Family folklore says Harry was a tramp and too idle to work! Probably the Harry Franklin referred to in Katherine Harris' history Up the Hill and Down the Hill. William (Bill) James Kingscott Franklin (1870-1961) was born at Atworth. Records show that he married Harriet Ricketts (b 1857) in London and in 1901 they lived in Devizes Road, Box where he worked as a quarryman. They had a daughter, Nellie, born about 1894. In 1911 they lived in Turnpike House, Devizes Road, Box where William was employed as an underground stone sawyer. We have now found a 1961 diary by David which tells us that brother Bill’s funeral took place in 1961. Death records prove that he had died in Christchurch, Hampshire, at the age of 91 where we think his daughter lived. Edward Victor Franklin (b 1877) married Ada in 1903 and in 1911 they lived at Bradley Road, Southwick, Trowbridge. Evelina (Lena) Augusta Franklin (1881-1974) was working as a parlour maid at Ashton Lodge, Long Ashton, Somerset in 1911 until she married Samuel Marshman in that year. After their marriage he and Lena worked at a golf club in Scotland where Sam was the steward. It is understood that Lena had a persecution mania and her behaviour meant they had to leave. There are fond memories of Aunt Lena - diminutive, rather eccentric, and fun. She ended her life in Beechcroft Care Home in Swindon. Lucy Ella Franklin (1884-1965) married Sidney Sheppard, also of Old Jockey, in 1905. Little is known of the other children: Francis Frederic Franklin (1885-1980) and Arthur Henry Franklin (b 1888). It is through David Franklin that the story continues. Roy, Len, David Herbert (father), Edie, Emily (mother), Rex and John). At some point David and Emily moved to Southbrook Street, Swindon, where David continued his role as postman. Emily died in 1955 and David remained in the house with his son, Jack until Jack’s marriage and move to Old Town. The house was then sold and David divided his time between living with Jack and Hazel and with Rex and Edie in Upminster. His grandchildren saw a lot of him during this time. Eventually more care was needed for David’s failing health and he became a patient at Roundway Hospital in Devizes, where he died in 1966. David and Emily had five children: Roy, Len, Rex, Edie and Jack. John is the son of Roy. William Roy Franklin (1912-2005) started work with Frederick Wright, tobacconist, in Cheltenham, travelling from Swindon, daily, by (we think) a motorbike. 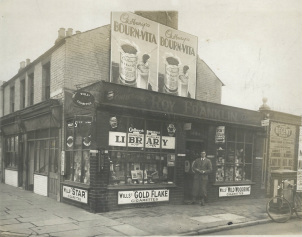 In about 1936 he set up, with help from his father, a small confectioner/tobacconist shop on the corner of Manchester Road and Whitehall Road, Swindon. He married Agnes Phyllis Mary Culling (1912-2005) who lived in Northern Road, Swindon on 3 July 1937. As children, both had lived in Southbrook Street. Roy ran the shop until about 1960 when he sold it. It was not making money - traffic lights on corner, double yellow lines and other shops now selling tobacco - and they needed a regular income as there were now three children. He took a job as a checker at Pressed Steel, Swindon until his retirement in 1978. For much of this time he worked night shifts. Roy and Phyl bought 45 Churchward Avenue, Swindon when they married in 1937 (we understand for a deposit of £25) and they lived there until November 2004. By this time Phyl was incapacitated with arthritis and Roy had become her carer, with a lot of help from their daughters and others. A family decision was made to move them into care together in Wroughton. Four weeks later, on Christmas Day, Phyl had a stroke which hospitalised her until her death on 31 January 2005. Roy had not easily accepted the move into care and deteriorated rapidly. He died at the care home on 14 February 2005. They are buried together in Whitworth Road cemetery, Swindon. Malcolm H (1937-2002) who remained single; and Margaret (b 1945) who married Terry Barnes (Barnes Coaches, Aldbourne) in 1968. They now live in Somerset and have a son and a daughter and have grandchildren. Ernest Rex Franklin (1909-2001) married Edie Hood his next-door neighbour in Southbrook Street, Swindon. He worked for Customs and Excise and lived in Upminster, Essex until his death. They had one daughter, Judith, who married Andy Small in 1968 and they still live in Upminster. Judith and Andy have two sons, Richard and Thomas and two grandchildren. Lucy Edith (Edie) Franklin (1907-1989) married Jack Parker and they lived in Wootton Bassett where Edie became a local councillor. They had one child, Linda, who died in 2003. She married Paul Caudell. They had no children. John (Jack) Franklin (1911-2000): Little is known about Jack’s early life. During World War 2 he served in the Merchant Navy, North Atlantic Fleet, and post war he trained as a secondary teacher and taught at Pinehurst Secondary Modern and then Ferndale Secondary Modern. He left teaching to work for Radio Rentals in Swindon. Later in his life he married Hazel - the marriage was short and there were no children. He lived at Tythe Barn Crescent, Old Town and eventually moved into an Abbeyfields Care Home in Swindon until his death. 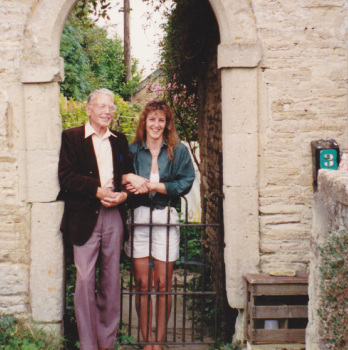 Roy and Phyl had three children: Jane, John and Julie (pictured in July 1997 on Roy and Phil's diamond wedding anniversary). Sadly, there are no grandchildren for Roy and Phyl. The Franklin name from this branch of the family will die out with John. Peter John Franklin was born in 1944 and it was he and his wife Maureen who visited the village in 2014. John graduated from Manchester University in 1965 and taught for four years in Swindon. He married Maureen Ann Pettit on 20 December 1969. They moved to Hampshire in August 1970 following promotion to a new secondary school in Havant. This was followed by a couple more teaching posts in the area and a house move to Chichester followed. John retired from full-time teaching in 2002. Julie Ann Franklin (b 1940) trained as a PE teacher and later worked as a Personnel Officer for a pharmaceutical company which was relocating to Swindon. Her local knowledge was valuable. She then returned to peripatetic counselling for Swindon Education Authority. Jane Noelle Franklin (b 1953) trained as a beauty therapist at Cannock and returned to Swindon where she set up her own salon. A move to Cornwall saw a second salon. She now lives in Highworth. For those who remember the heading of this article about history repeating itself, this is the proof. Having gone their separate ways from Box, you might expect that the family lost all contact with the village. But you would be wrong. Some family memory or anecdote brought them back as they wished to capture the connection with their forefathers. 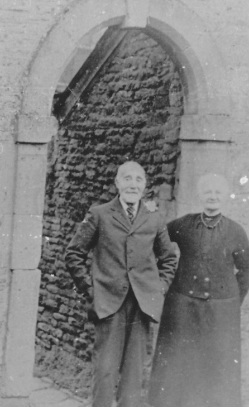 First under the arch were David and Caroline Gale in 1936, celebrating their diamond wedding (left). Next to complete the pilgrimage to the Old Jockey was Rex Franklin who came from Essex in 1993 and posed with Yvonne Johnson, who was born at The Old Jockey (middle). Finally we had the pleasure of meeting John and Maureen in 2014 (pictured right). John and Maureen would love to hear from you if you have information about other branches of the Franklin family.